When I finish rounding the perimeter of the grocery store, the first aisle that usually pulls me in is right around the corner from the meat and seafood counter. It’s the one with nuts, olives, salad dressings, and other oils and condiments. This aisle should be called good fats versus bad fats. Here are a few tips on how to navigate this section of the store. Let me touch upon a few things regarding oils. First, when it comes to the healthy fats, the main thing you should be looking for on a Nutrition Facts label is the percentage of saturated fats versus monounsaturated and polyunsaturated fats (MUFAs and PUFAs, respectively). In various cooking oils, there are higher levels of MUFAs and PUFAs than saturated fats. The powerful omega-3 fatty acids are a PUFA. These are the ones that will protect your heart and even the health of your brain! Oils such as flaxseed, canola, and soybean have higher ratios of omega-3 PUFAs. Coconut oil, which is currently all the rage, is higher in saturated fats, but the type found in this oil is primarily medium-chain triglycerides (lauric acid, specifically), which are a good type of fat that is not found in many foods. Claims made (although not necessarily proven) about coconut oil include that it will improve mood, reduce hunger, boost the immune system, and aid in weight loss. But beware, even the good fats are still bad if consumed in large quantities. Nuts are chock-full of nutrition, but the overabundance of commercialized packaging and marketing has consumers grabbing the wrong kinds off the shelf. Tree nuts such as almonds, cashews, walnuts, pine nuts, and pecans are high in protein and MUFAs and PUFAs. However, once you start to see them dipped in chocolate or glazed in brown sugar…well, it begins to defeat the purpose of having a healthy handful of nuts. Sort of like how grilled chicken and fried chicken just aren’t the same thing nutritionally. Don’t get me wrong, a salad with glazed walnuts or a pecan-crusted salmon dish can be amazing. Just be aware of the extra sugars and calories that may be present and necessary to account for in your diabetes regimen. 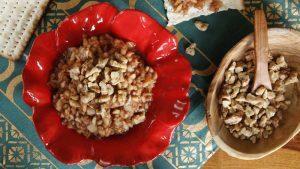 Nuts are filling and are a great quick pick-me-up for that afternoon slump we all get into during the week. 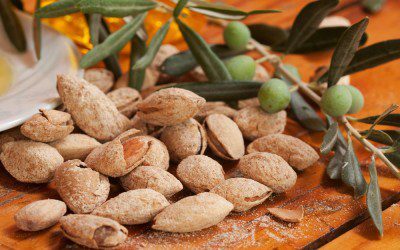 If you really need a touch of flavor or salt to enjoy your nuts, go for those that are lightly dusted in cocoa powder or sea salt. Also, note that any sort of trail mix that has M&M’s or other candy is not necessarily the best choice. These are good for a quick burst of energy while on a hike, but not for a daily afternoon snack. Don’t forget about the array of tasty nut spreads that are now available alongside the staple peanut butter. You can get your daily dose of good fats from many different types of nut butters on the market now, such as almond butter, hazelnut butter, and macadamia nut butter, and decide which one suits your tastes. The same goes for the benefits of various seeds, such as flax and chia, to name a couple that have been in the spotlight recently. Olives are a particular favorite in our household. I am surprised my daughter hasn’t sprouted olives out of her ears, she eats so many! This is a type of food that is often forgotten unless it is on a salad, and that is unfortunate. Olives are one of the staple foods of the ever-popular and healthful Mediterranean diet. They are so versatile and can be used in many different recipes, from pastas to sandwiches. Olives are good sources of MUFAs and fiber, as well as antioxidants (substances that help protect cells from oxidative damage). The great thing about the above-mentioned food items are that, unless they are coated in a sugar glaze, they shouldn’t have too much of an effect on blood glucose. So if you are someone who is looking for healthy, low-carb snacks mid-morning or mid-afternoon, pack yourself some olives, nuts, and cheese and know that you are giving your body some fantastic nutrition while limiting the rise in blood glucose. A win-win!